Last week I experienced a different sort of Christmas party. And I had a great time. I’ve mentioned that I’ve been working on becoming a Mad Man, hanging out at a local advertising agency. It started with the president of the company letting me use an empty office to blog and work on my job search, and has gradually morphed into my helping out with some business development, consulting and PR work — and a little writing, as well — all while I keep up the job hunt. Not to continue being coy, that company is ADCO, here on Pickens Street just off of Gervais. (And that’s my ADCO office you see in the background of such recent videos as this one and this one.) The president, Lanier Jones, is also president of my Rotary. If you don’t know Lanier, you may remember him from a column I wrote about going with him to give blood for the first time. Anyway, Lanier and his partners Brian Murrell and Lora Prill and all the folks — including my son’s mother-in-law, Ginny Herring, with whom I now share a precious grandchild — have all been wonderfully welcoming, and we’ve had some good times together so far. Such as the Christmas party Friday. It was an unusual party. 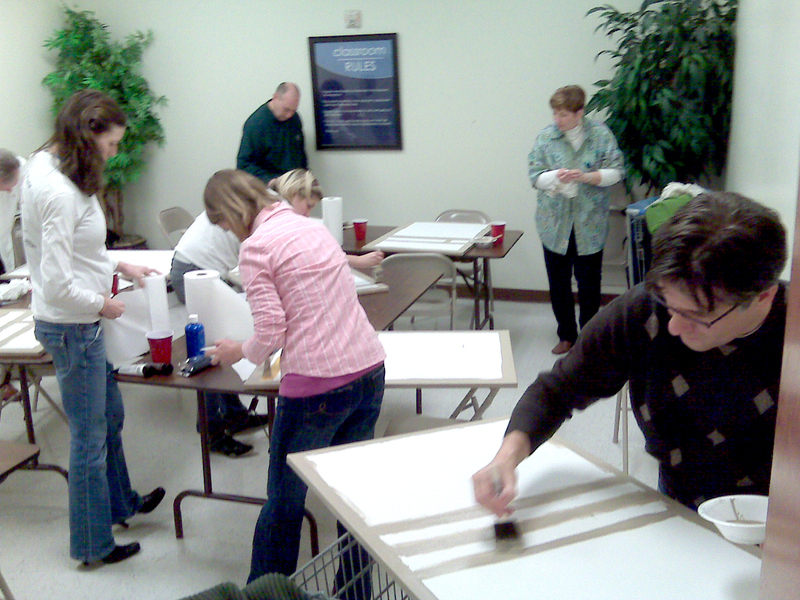 We had it at Hobby Lobby, and, once the refreshments were cleared away, Brian handed out blank canvases and urged us to create some artwork for the walls of ADCO. He provided some guidance, fortunately — he wanted something in the style of Mark Rothko (he particularly held out the one at right as an example), and in colors that would work well in the office. If Brian decides it doesn’t pass muster and I get to keep it, it’s for sale — for, um, $100 … I mean,$10,000 (out of which I’ll happily reimburse Brian for the canvas and paints). Unless you think I should ask for more. This entry was posted in Uncategorized on December 23, 2009 by Brad Warthen. 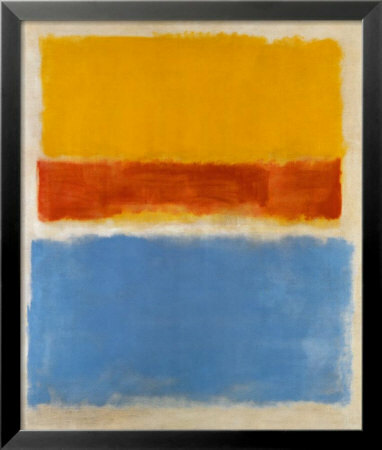 Rothko (whose work was, of course, prominently featured in a Season Two Mad Men episode) was an Abstract Expressionist. It wasn’t all about boxes. Since I could clearly see your representational intent (trite, darling, trite–too much time in Catholic churches, I see), perhaps another assignment might yield better results? See — everybody’s a critic. KF beat me to the Mad men reference. You might recall that some of the junior ad guys snuck into the bosses’ office to ogle the Rothko and were nonplussed. However, a psychiatrist might glean something from your attempt. It’s kind of spooky. 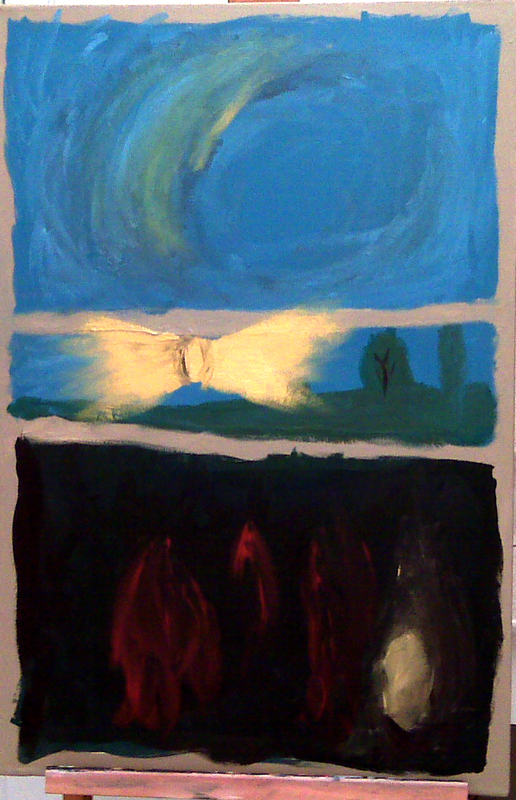 Going representational in a work that you expect to be abstract is my way of being a rebel. I’m of the Reactionary Impressionist school… You know, I just made that up, but then it occurred to me there probably IS one. I need to go back and read The Painted Word again. That’s my art appreciation bible. Just as I learned what little I know about modern architecture from From Bauhaus to Our House. I think that pretty much explains the “painting”. You may want to look into severing an ear in order to pump up the value. Let’s see, the bottom one looks like a picture of a KKK rally taken at night some distance from the torches. The middle one indicates a possible obsession with bow ties. Is the top one a representation of a whirlpool? As the guy used to say on “Laugh-In” Ver-r-y interesting–but strange. I’d tell you to keep your day job, but that would just be mean. I don’t know if it it was a good idea to post the artwork and the dream in the same week. It’s Brad’s terrorist dream again. big explosion on earth–do they go to heaven or hell? and where are the virgins? I like it… To me it says… Someone is learning that it’s fun to create. Cajones for posting it, as, yes, everyone’s a critic. I like the contrast that escalates from panel to panel, ending up shocking and creepy in the bottom one. Tell Brian it’s your artistic interpretation of Famously Hot and Surprisingly Cool. I’d totally hang it on my wall. and the middle panel is a car wreck! So Columbia!